Pinning down the essence of postmodernism as a philosophical movement can be an intimidating task. Engaging with it fruitfully from the standpoint of Christian thought can be even harder to pull off. James K.A. Smith, a professor of philosophy at Calvin College, admits an awareness of these difficulties in the opening pages of his 2003 book Who’s Afraid of Postmodernism? : Taking Derrida, Lyotard, and Foucault to Church, which grew out of a set of lectures he gave at the L’Abri Fellowship in Switzerland. 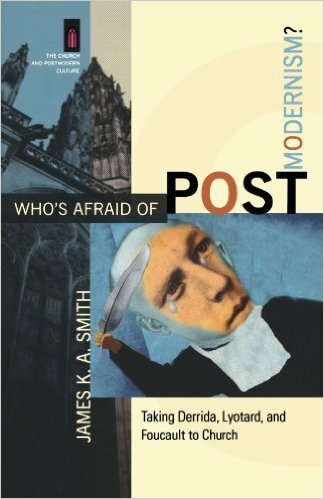 Smith differentiates “philosophical postmodernism” from “postmodernity” as a cultural condition, arguing that in order to creatively engage with the latter, Christians must first acquire a good understanding of the former. Why? As Francis Schaeffer wrote, “Ideas have legs.” Smith expands on this phrase, telling readers that, “Schaeffer offers what we might call a trickle-down theory of philosophical influence: cultural phenomena tend to eventually reflect philosophical movements” (p.20). Of course, Christians have responded to postmodern philosophy with varying levels of hostility and enthusiasm. As Smith puts it, “To some, postmodernity is the bane of the Christian faith, the new enemy taking over the role of secular humanism… Others see postmodernism as a fresh wind of the Spirit sent to revitalize the dry bones of the church” (p.18). It would be naive to assume that postmodernism is a tidy, well-defined concept. To the contrary, Smith acknowledges that it’s an “admittedly pluriform and variegated phenomenon” that contains both many continuities and discontinuities with modernity (p.26). Smith embarks on his task of introducing readers to this philosophical movement that “has come slouching out of Paris” by engaging with three of its more influential thinkers and the main slogans associated (for better or worse) with each of them: Jacques Derrida (“There is nothing outside the text”), Jean-François Lyotard (“Postmodernity is ‘incredulity toward metanarratives'”), and Michel Foucault (“Power is knowledge”) (p.21). We will limit ourselves to his discussion of Derrida, though of course Smith’s discussions of Lyotard and Foucault are also thought-provoking. The phrase that Smith organizes his lecture around,”There is nothing outside the text,” comes from Of Grammatology, one of Derrida’s earlier works, and at first glance it’s puzzling. Smith explains that many have understood Derrida to mean that “the whole world is a kind of book—that there are no cups or tables or spouses… As such, many have understood Derrida as a linguistic idealist who thinks that there is only language, not things” (pp. 34-35). Why does this understanding of Derrida’s claim strike so many Christians as problematic? Smith points out at least two reasons. First, linguistic idealism appears to rule out the possibility of believing in a “transcendent Creator who is distinct from and prior to the world” (p.35). Also, “if there is nothing outside the text, then it would seem that what the Bible (admittedly a text) talks about—what it refers to—is not real” (p.35). Thus, many conclude that Derrida’s claim is opposed to the orthodox Christian faith. Smith critiques this conclusion by arguing that it is based on “a serious misunderstanding of what Derrida means when he claims that “there is nothing outside the text” (p.35). Thus, what Derrida really means is that”there is no reality that is not always already interpreted through the mediating lens of language” (p.39). For many Christians, this doesn’t seem like much of an improvement. Recognizing the “interpreted status of the gospel” should indeed help Christians remain humble when doing theology in public settings, but it shouldn’t lead to doubt about the gospel’s truth. Smith explains that, “If the interpretive status of the gospel rattles our confidence in its truth, this indicates that we remain haunted by the modern desire for objective certainty” (p.51). He also suggests that Derrida’s words should cause Christians to once again ask themselves if the Scriptures truly govern how they perceive the world around them, commenting that, “One of the challenges of Christian discipleship is to make the text of Scripture the Text outside which nothing stands” (p.55). There is surely much more that could be said about Smith’s interaction with the work of Derrida. However, since I’m only somewhat familiar with postmodern thought, I’m going to be cautious in evaluating Who’s Afraid of Postmodernism? I suggest that this unholy trinity of Derrida, Lyotard, and Foucault might in fact push us to recapture some truths about the nature of the church that have been overshadowed by modernity and especially by Christian appropriations of modernism. One of the reasons postmodernism has been the bogeyman for the Christian church is that we have become so thoroughly modern. But while postmodernism may be the enemy of our modernity, it can be an ally of our ancient heritage. In short, it might just be these Parisians who can help us be the church (p. 23). This entry was posted in Book Reviews and tagged Deconstruction, Hermeneutics, Jacques Derrida, James K.A. Smith, lectures, Philosophy, Postmodernism, textual interpretation by joecrow91. Bookmark the permalink.